115 miles this month. I have learned this month that looking just at the numbers does not tell the full story. 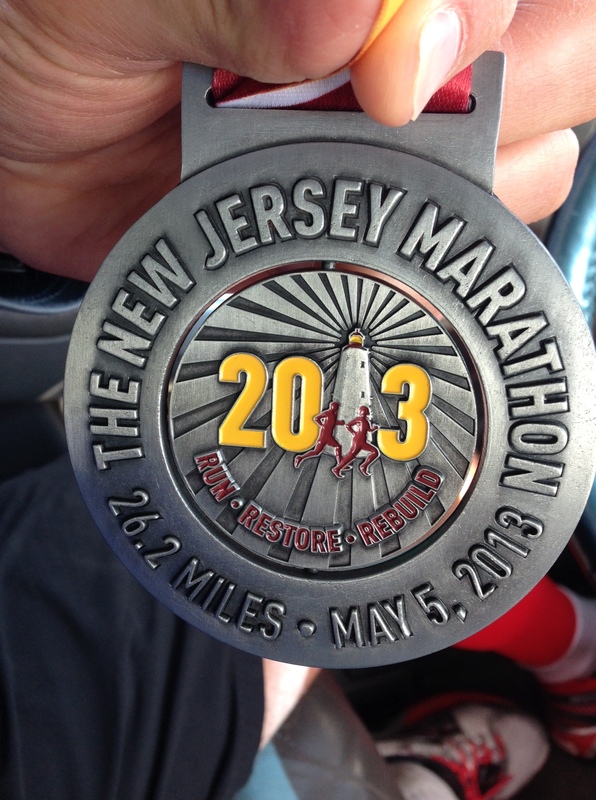 I started the month with high expectations for achieving a PR at the New Jersey Marathon. I was just coming off a PR in the Atlantic City April Fool’s Half Marathon which I thought would be a pretty similar terrain being by the shore and I had definitely put in the miles of training. As you can read from my race recap things didn’t go according to plan. I didn’t achieve my PR and felt fatigued. This manifested itself about 10 days later when my body just ran out of juice. Rather than be in a funk about why I hadn’t achieved my goals and looking for a dozen reasons why I felt bad I took the time to look at how I got here, what I was doing right and what I was doing wrong. It basically came down to quality vs quantity. I took a couple of days off and readjusted my goals and my training. Hopefully going forward the changes I am planning will pay off. You can read about that here. 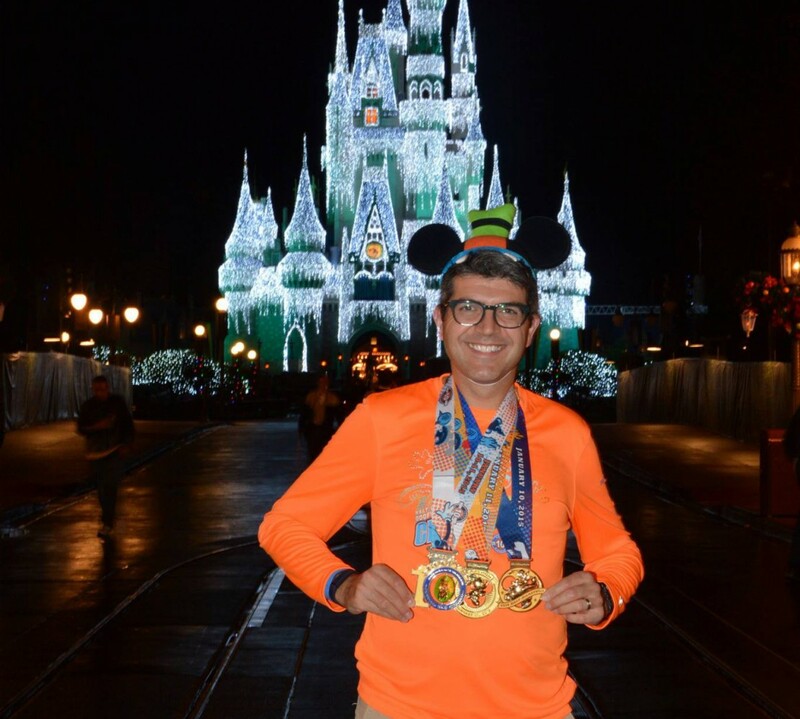 This month I launched a Virtual 5K run to raise funds for Autism Speaks for the 2014 Walt Disney World Marathon Weekend where I am running in the inaugural Dopey Challenge. So far the reception to this has been great. Many people have signed up and the first 100 medals have been ordered. I encourage you to sign up and participate if you can just for the fun of it. 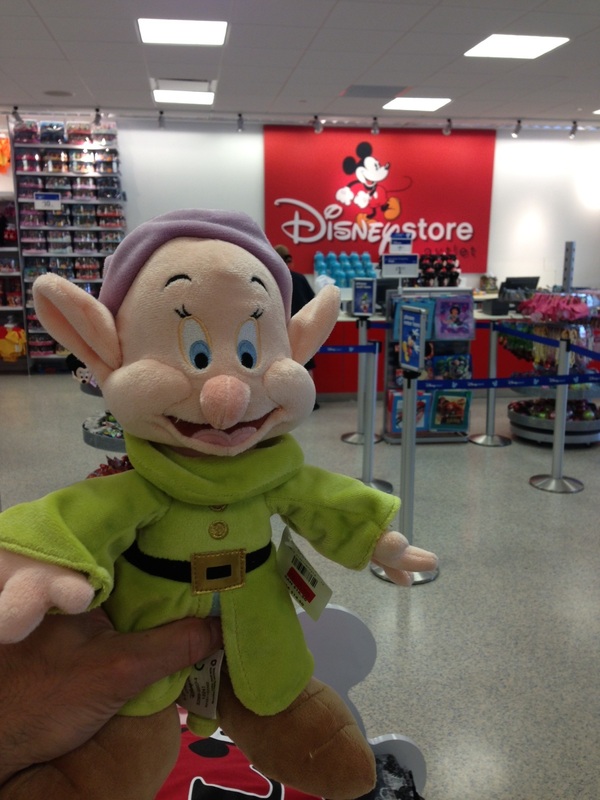 Remember, if you fully participate and post a picture of Dopey on your run you may be eligible for one of the prizes. See this post for details. At the end of the month we celebrated Memorial Day weekend and the official start of the summer. It was a fun weekend as I got to spend a lot of time with the family and celebrate my 10th wedding anniversary. You can read about that here. Finally, based on a little encouragement, I am venturing into uncharted territory. I have basically been running using Jeff Galloway’s Run/Walk Method since February 2011. It has served me well and got me through 5 marathons. When I revisited what I had been doing as discussed earlier I noticed that although I was putting in the miles I was not getting any faster and all my runs were pretty much the same. Ultimately I want to improve on my marathon times going forward and during the New Jersey Marathon even my walk breaks didn’t seem to help. I am currently reading Pete Pfitzinger’s book on Advanced Marathoning and although I do not expect I will train at that level or follow his plans I am looking to change up my running experience. Over the last three runs I basically threw caution to the wind and did not use the Galloway Method. 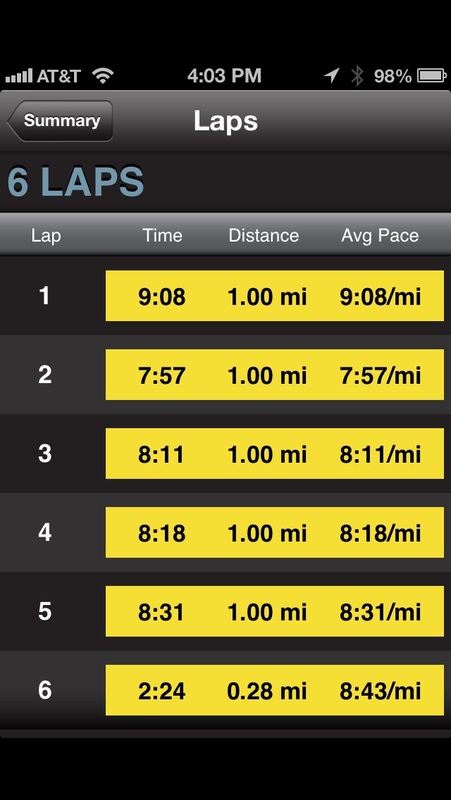 I ran a 6 mile easy pace run, a 5 mile tempo run and this morning I ran 10 miles without stopping. These are the furthest distances I have run non stop. That sounds silly coming from someone who has run 5 marathons (including a Goofy Challenge) but I want to see what I can achieve. I believe somewhere out there is a 3:30-3:45 marathon that I can run. It’s worth a try. I’ll be watching carefully how my body reacts and I am open to using Galloway again in the future if I think it will be beneficial. I already plan on doing something like that during Dopey just so I can survive the event! Looking at the last 3 days of runs it seems to be working so far and I feel okay. Judging from my splits over the last 3 runs my average pace is already that bit quicker. We will see what the future holds I guess. Speaking of future plans, I have a 5K coming up this Sunday (June 2nd) which I will be pushing my two boys in the running stroller again…no PR there 🙂 and on June 16th I will be running the San Francisco Half Marathon with my Wife. I then have the 25 miles Cycle Bucks County event on the 22nd. Lot’s to look forward to. 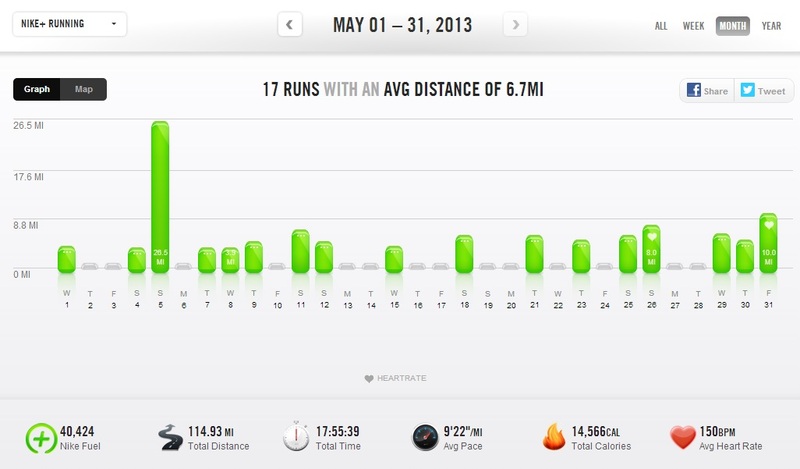 June should be a pretty low key month as the training for this year’s Philadelphia Marathon and January 2014 Dopey Challenge start in earnest in mid-July. 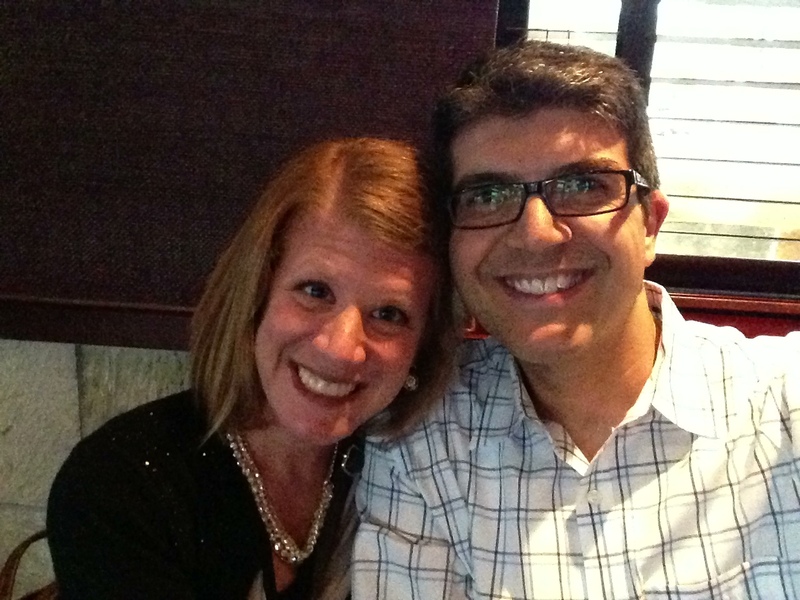 In addition to being Memorial Weekend and the official start of the summer season this weekend my Wife and I celebrated our 10th wedding anniversary. We kicked off our celebrations with a nice dinner at P.F. Chang’s which meant we had chalked up an extra couple of miles mid-week to save our calories for our anniversary dinner. Luckily for us that we did as we were given a free dessert by our waitress for our anniversary and just a few minutes later another free dessert. I like that place for some reason. I could taste the miles with every bite. Ha! With our kids staying overnight at my in-laws we started the weekend with a 10K run in Tyler State Park to celebrate our 10 years. The weather looked a bit iffy overnight but we lucked out and started running as the clouds cleared and got some magnificant sunshine. 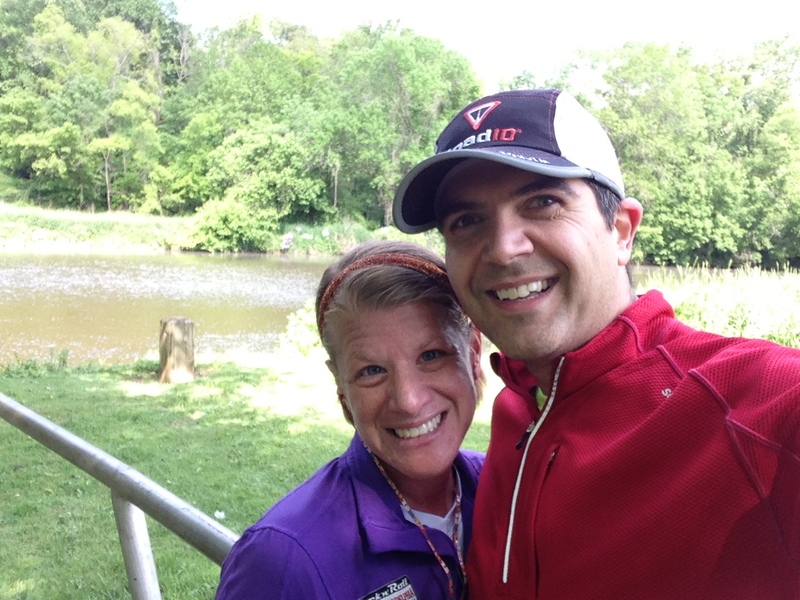 It was nice to run with Shari in the park as we both train there but we have never run together there as someone is always at home with the boys. After the run we headed over to the Newtown Athletic Club where I had a massage booked (a birthday gift from Shari that I finally got around to using). When asked by the masseuse what type of treatment I wanted I told her that I was a marathon runner and she should use her judgement but I wanted to be able to run tomorrow. I think she went easy on me but it still hurt…but it was a good hurt I think. It was nice and relaxing and I felt refreshed once it was over. After lunch together we picked up the boys and got together with some friends so all our kids could play together for the evening. While we were at our friends house my friend Mike suggested I look into reading the book ‘Advanced Marathoning‘ by Pete Pfitzinger if I wanted to look into increasing my speed which I had been discussing recently. I look to Mike for advice as he is a long time runner and still a great competitor and he is patient enough to listen to all my questions. We’ll see how this works out. On Sunday we let the kids sleep in and took our time to get going. 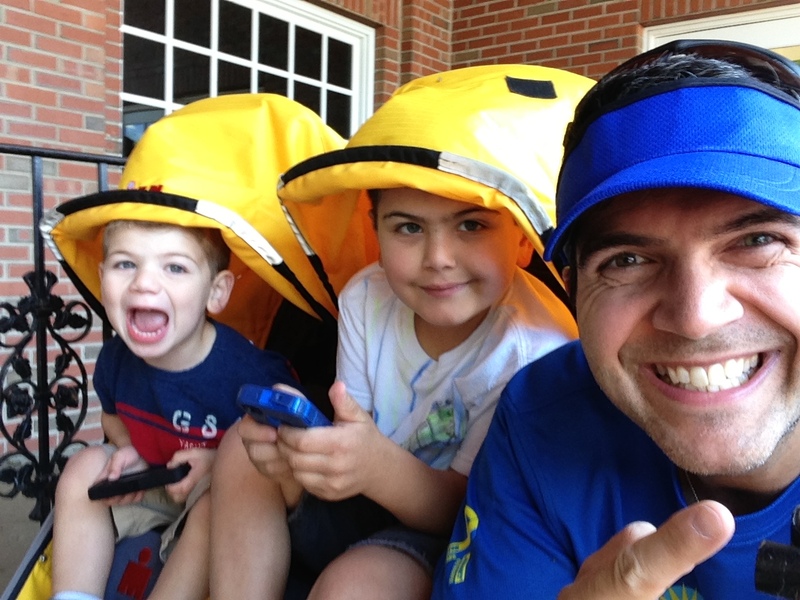 We headed to Yardley to run the Delaware Canal with the boys in the stroller for a family run. 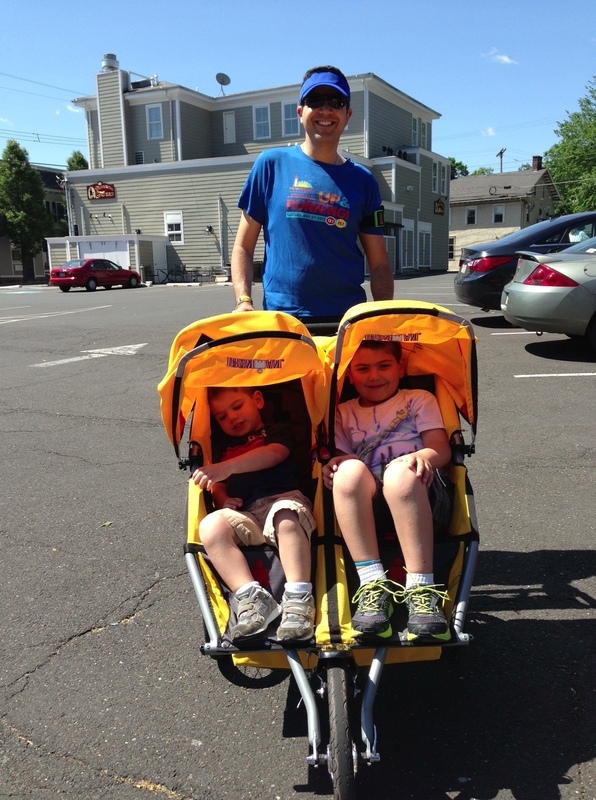 We bought this stroller last year to take the boys out together with us when we run. It’s a great piece of equipment for us. My boys however are growing quick and are testing the weight limits of the stroller and pushing this gives me a pretty good workout (I can still feel my triceps two days later). 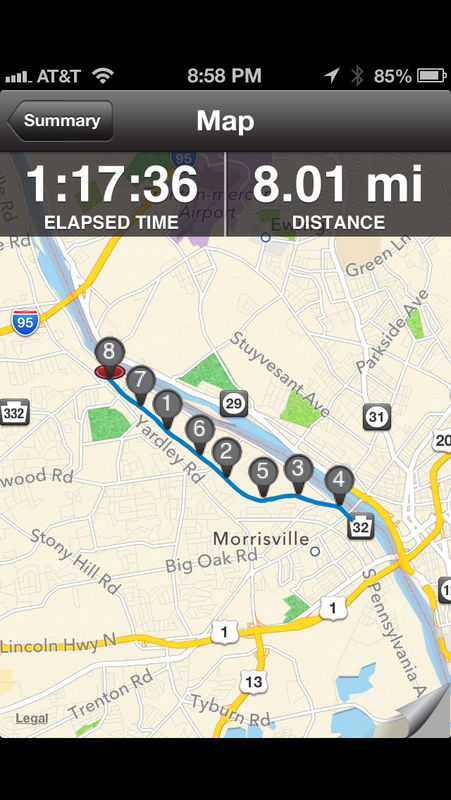 Luckily the Delaware Canal Tow Path is nice and flat and we managed 8 miles together. The boys were awesome and Shari and I pointed out the wildlife as we ran. Funny thing happened within the first few minutes in that my GymBoss timer (I use for the Galloway method) flaked out on me. Rather than stop and fiddle around with everything on the run I just went with it and ran without my usual intervals. Did pretty well running the first couple of miles pushing over 100 pounds of boys without needing to stop. Something else to work on I guess as I take this time to work things out before the marathon training starts in July. When we do the Canal run we park at Cramer’s Bakery in Yardley so we have a place to grab a cup of coffee when we finish. With the boys we promise them a treat from the bakery if they are good during the run. It’s amazing how good boys can be when you promise them a cupcake or a brownie. 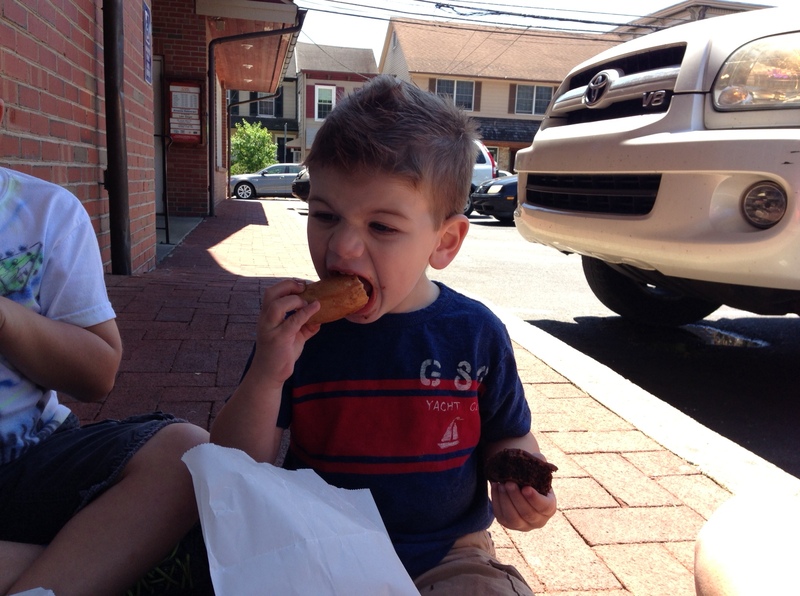 Anyway, we finish up the run and park the stroller at the bike rack next the bakery, choose our treats and sit outside the front of the store to eat and drink before heading home. 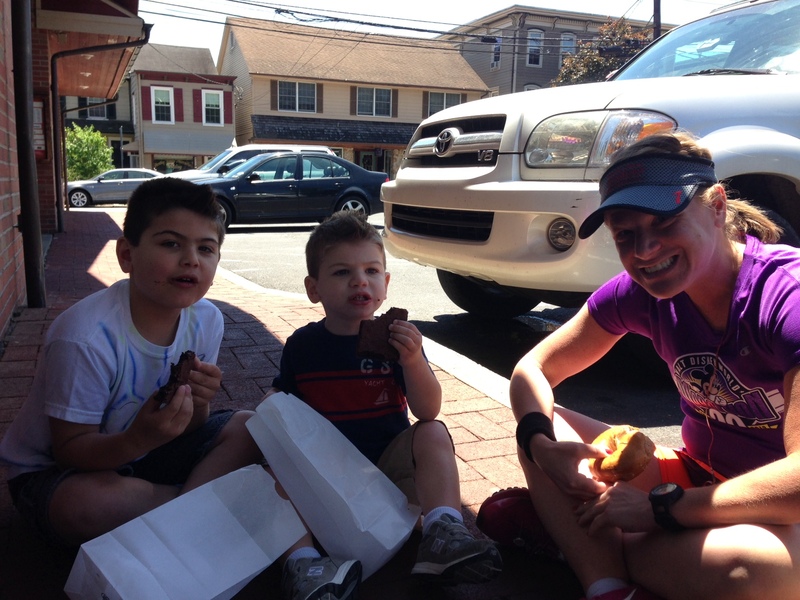 As you can see by the photo below Asher must have worked hard during the run as in addition to his brownie he needed to take Shari’s bagel…he needed the carbs I guess?!? So how far did you run kid? So, how do you follow two days of family runs? You get up at the crack of dawn on a holiday and head out for a bike ride. I got up at 5am on Monday morning, hitched my bike to my car and headed out for my first outdoor ride of the season. 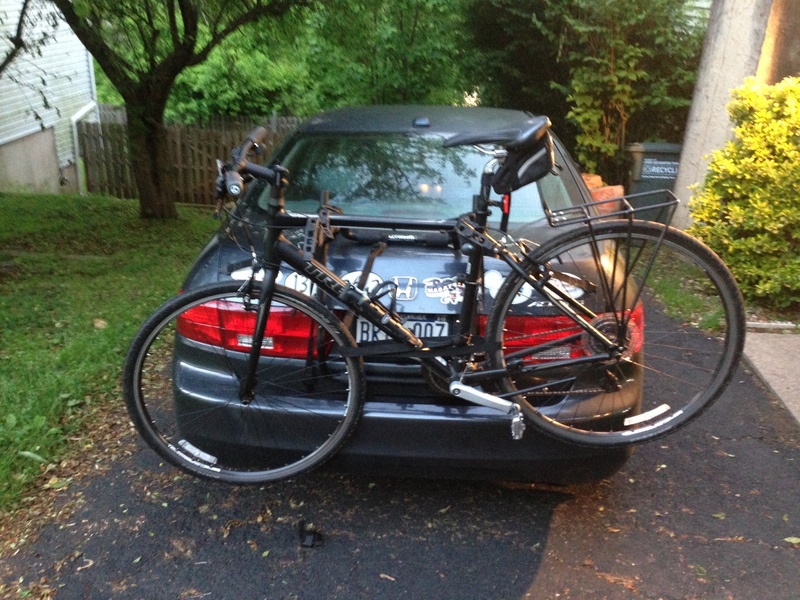 The bike rack is back on the car. It will be there for the summer now. I headed out early to the canal path where we ran yesterday. It was a little cooler than I had planned but other than really cold fingers I was pretty much appropriately dressed. 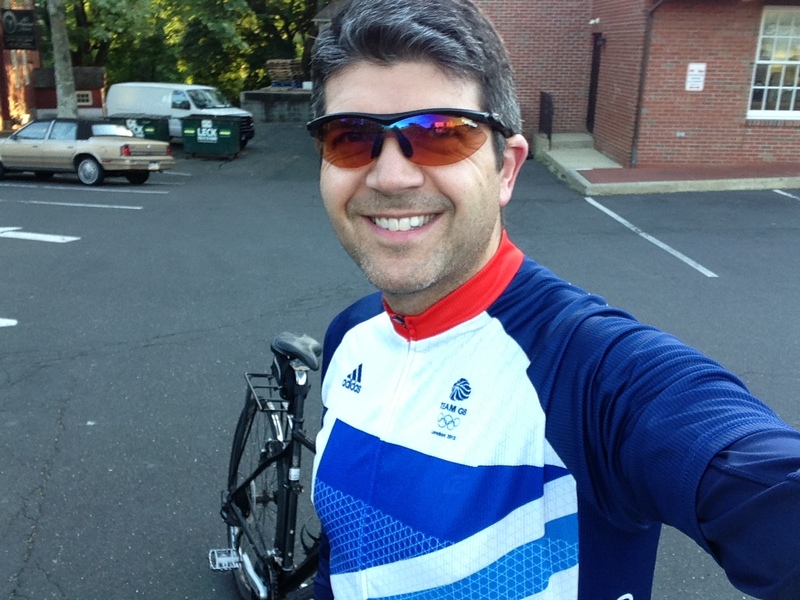 I wore my new Team Great Britain cycling jersey for this ride. The ride itself was fine. 20 miles from Yardley to New Hope and back. It felt good. I have a 25 mile ride in a few weeks on a very hilly course and while this was flat it was still a good test for going long. I’ll deal with the hills when I get there. Below is the ride summary. I finished my ride and got back home around 8.15am so Shari could go out for a run. The boys were still asleep when I got home so I had a nice cup of coffee and a bagel with peanut butter and honey. Now that was a treat. Micah – who wore it best? Once Shari got back we got the kids, our picnic lunch and headed out to the Philadelphia Zoo for the afternoon before heading back for a family barbeque. Hope you all had a good holiday weekend too. Also, as a quick reminder, now that Memorial Weekend is behind us here’s an activity for next weekend (and through July 31st). Great fun for a great cause with great prizes. Check out the great medal too. 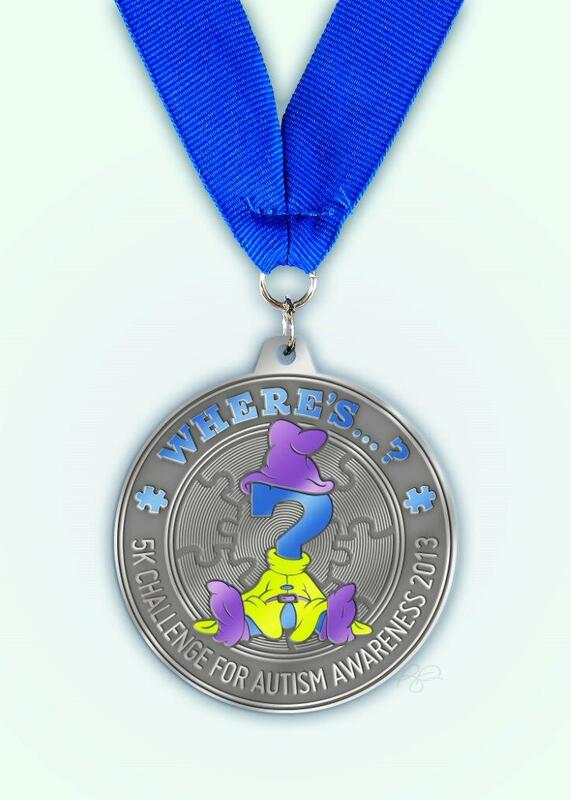 Everyone who enters receives this specially designed medal! 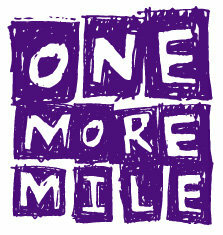 As it is a virtual run you can run/walk this 5K anywhere in the world before July 31st. You can head over here to sign up. Don’t forget to send your photographs in to be eligible for one of the prizes. Last Wednesday morning I got up for a planned 6 mile run around the park near to our home. It was 10 days post the New Jersey Marathon and I felt no physical discomfort and 6 miles is a typical mid-week run distance for me. This run, however, was far from being a typical run. I quit the run after 4 miles not because of any physical pain but because I just didn’t have the energy to do more. Those 4 miles felt like miles 21-24 of a marathon. My heart rate was into the high 170s much like it had been during the marathon. I was beat and I was beaten. I posted my feelings on a running related Facebook group and got the general feedback that I needed to relax, take a break, smile and look back on my achievements. I should have seen this coming as the signs were there a couple of weeks before I ran the New Jersey Marathon but that was during the taper and I just put it down to coming off the big mileage weeks and needing to recover before the big day. I took the next couple of days off as it was obvious I needed to and took a look at my training history in Garmin Connect. What I saw was that I had been training 5 days a week without a break since January 2012. In fact I jumped into the NJ Marathon training straight after completing the Goofy Challenge this year at week 3 of the plan as that was how the plan worked in with the race date. From looking at my training history I took stock of how I got here and what I needed to do to get my ‘Mojo’ back. Bear in mind that I am still a fairly novice runner (in my mind) having been doing this for about 2.5 years. I did indeed stop and relax. I took the next couple of evenings to catch up on a few shows that had backed up on the DVR as a consequence of trying to get my early nights for the next day’s run and also pushed the alarm clock back to allow myself an extra 1 to 1.5 hours sleep in the morning. That was a good start. I also thought of the reasons why I run. It was really about my health. It was never that I was going to start running to complete marathons. 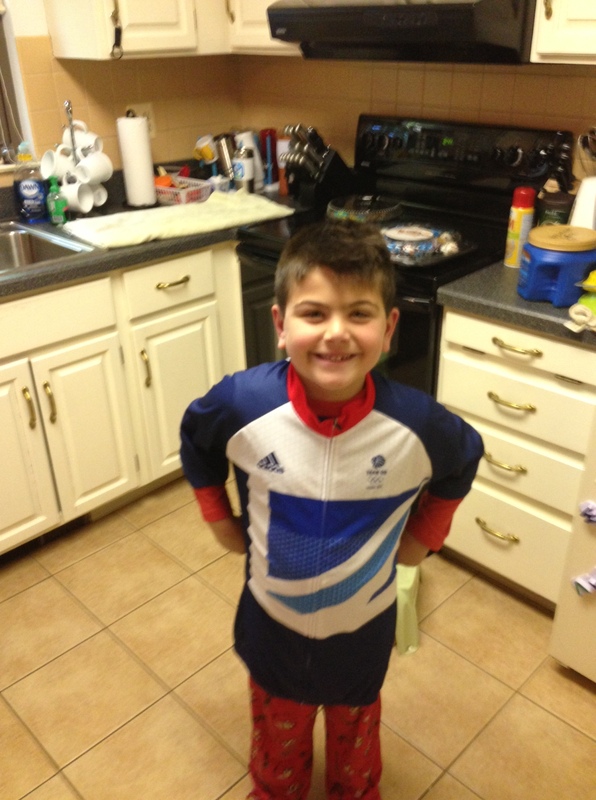 I started to run so I could lose weight and be healthy to do all the activities with my two young boys. The races and endurance events only came about as I gained confidence with my abilities and saw the opportunities it offered me in terms of personal achievements. I also took a deep dive into what I was doing, or more specifically, how I was doing it. I am not an elite runner nor a racer and I don’t plan to be. I am my own competition. I set the challenges and meet the goals. What I saw from my training history is something that I had read about as a big training mistake. I had downloaded training plans and added them to my calendar so at any time I knew what I needed to run in terms of distance. To me it was making sure I hit the mileage goal for the week. If it said 12 miles I ran 12 miles. As I posted earlier this may be a little OCD and may have been a big factor in this. I met my goals in terms of quantity but I wasn’t really following the plan. These plans are designed by expert coaches with much more experience than I have. I’m no expert and based upon my look back I am in no position to coach!! I was reaching the numbers but not looking at the quality of the workout. 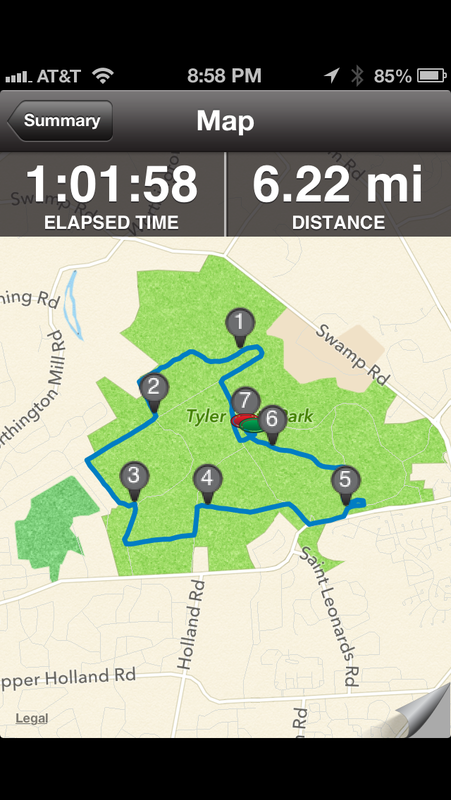 If the plan said run 6 miles ‘Tempo’ I ran 6 miles. If the plan said run 6 miles ‘Repeats’ I ran 6 miles. If it said run 6 miles ‘Race Pace’ I ran 6 miles. 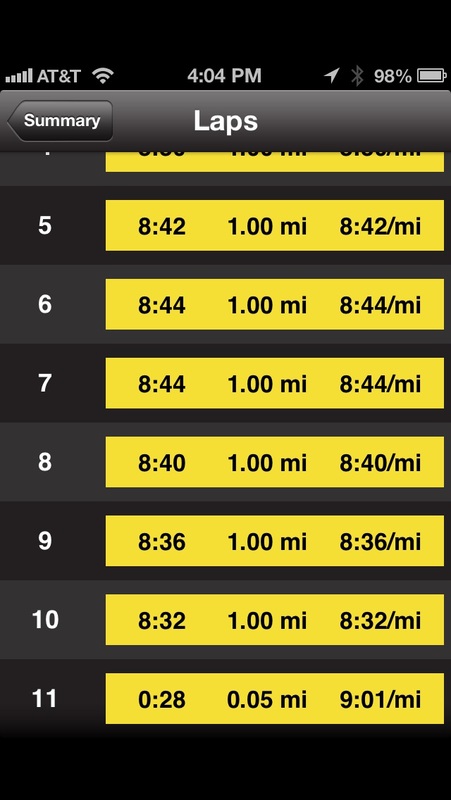 If you had looked at any of the runs uploaded into my Garmin Connect account you would not see a difference in any of these runs. BINGO! The plans are designed not to just build the ability to conquer the miles but the ability to train your body to conquer the miles well. Mix up the training to build up the right capabilities to run well not just run long. Some speed work, some hill training, some easy and long runs. They are all part of making me a better runner. I did not have the right focus. The results spoke for themselves. One of the other signs that my training was not going as planned was my diet, hunger levels and weight management. Having been overweight for much of my life running helped me loose almost 60 pounds and achieve everything I had to date. Since I completed the Goofy Challenge back in January I had put on about 6-8 pounds. This had frustrated me and probably pushed me into making sure I got those miles in and didn’t miss a day. I had a ravenous appetite and was pretty much eating more. I couldn’t in my head see the disconnect between the increased hours of training and the weight gain. I had started coming home from work pretty exhausted (yes, from a desk job) and had begun to rely on the 3pm espresso. Tip – you don’t want to be the guy who walks up to the coffee bar and the barista says “Hi Ian. The usual?” Ugh! So looking at my diet and my intake combined and with not running last week as much as I normally would I was very focused on my food. I stopped drinking my umpteen cups of coffee and drank water more throughout the day (which was a big factor when I initially lost the weight) and made sure that without the extra calories from running that I made sure I came in under or close to my daily calorie budget. I use an app to track my daily nutrition. It keeps me honest and helps maintain my weight after working so hard to lose it. So the overall result of my diet review was the same as how I had approached the mileage. Again, it’s amazing how I lost sight of this as diet has been a constant battle through out my adult life and this was as easy slip which I could have caught. I wrote earlier about my love of pancakes, but as they say, it’s fine in moderation. In my mind I had earned my calories and I had spent everyone last one of them and was still within my daily budget. I had lost sight of the moderation. Oops! I immediately started on the diet. That was the easy part. At work I’m drinking more water. I have my trusty Nathan Triton 24oz water bottle and pretty much sip from it throughout the day. No caffeine withdrawal issues LOL. I still have a cup when I get up and my travel cup on the way to work but I have done my best to eliminate any more caffeine (than is absolutely necessary) from my daily intake. Without the daily running I noticed that my appetite wasn’t as much on overdrive as it had been and I was able to meet my daily budget. That was a big fear. I survived. In fact I have lost about 4 pounds in the last week without any workouts. I was 171 pounds when I weighed in this morning which is just over my 168 pound goal weight. My body must have been expecting to work out every minute and so stored fuel. I guess I gave my body a rest and my metabolism decided it didn’t have to freak out and store food for energy!!! I looked at my training schedule. I am signed up for the Philadelphia Marathon this fall and the training starts in earnest in mid-July. This gave me a chance to continue to train but have some recovery time before that starts. 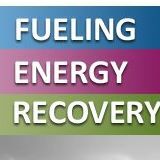 I looked at the resources I had in my Training Peaks account and decided to tackle the Runner’s World Winter Maintenance Plan. This is a 6 week plan which has 4 days of running with some cross training and rest days. The peak long run is in week 4 at 16 miles but this provides a mix of easy runs, tempo runs and mile repeats. I have never really focused on mixing up the types of training like this but aim to try this time around to make me a better and hopefully fitter runner. There is a track at the high school near me so I plan on using this as a place to do the speed work training. On the cross training days I plan to do some stationery bike work with some abs/core work and some lunges and squats to work the muscles around my knee and leg joints. We will see how that goes. Nothing like making your plans public to hold yourself accountable. It gave me a little confidence that I can get back in the game with a little focus. This week I ended up running just twice and only 10 miles but I learned alot from taking a little rest time and self reflection. This was a long one. Thanks for sticking with it. Marathon number 5 is now complete. It wasn’t pretty but I got the job done. I finished in 4:04:53. My goal was 3:55:00. I had high hopes going into this race that I could earn a PR. I had run just under 4 hours (3:59:05) in last year’s Philadelphia Marathon and had successfully completed the 2013 Walt Disney World Goofy Challenge and survived the extra distance. 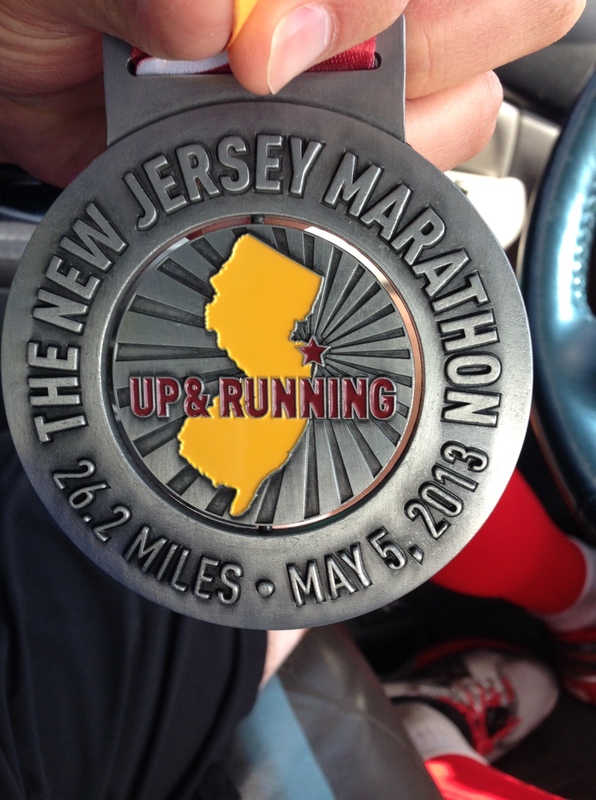 The New Jersey Marathon course was considerably flatter than the previous two marathons and I was just coming off a PR at the 2013 Atlantic City April Fool’s Half Marathon (1:52:43) in similar conditions, however, my PR was not to be on the day. Am I disappointed, a little, but I am still proud that I ran 26.2 miles and finished standing up with a smile on my face ready for my next marathon. Firstly I must give kudos to the Race Director Joe Gigas for a fantastic job in running this event. Despite all that has happened at the Jersey Shore in the aftermath of Hurricane Sandy (needing to change the actual route of the marathon) and the recent events in Boston (increased security at the start and finish areas) this went off without a hitch (to the observer) and even the weather cooperated. Joe and his team did a great job in getting everyone prepared for the race and for the last 10 weeks leading up to the event regular race director updates were sent out to participants. Each update focused on a specific aspect of the race day and preparations and I kept revisiting them to make sure I was prepared. This included updating security concerns in light of recent events. Thanks Joe and all your volunteers. 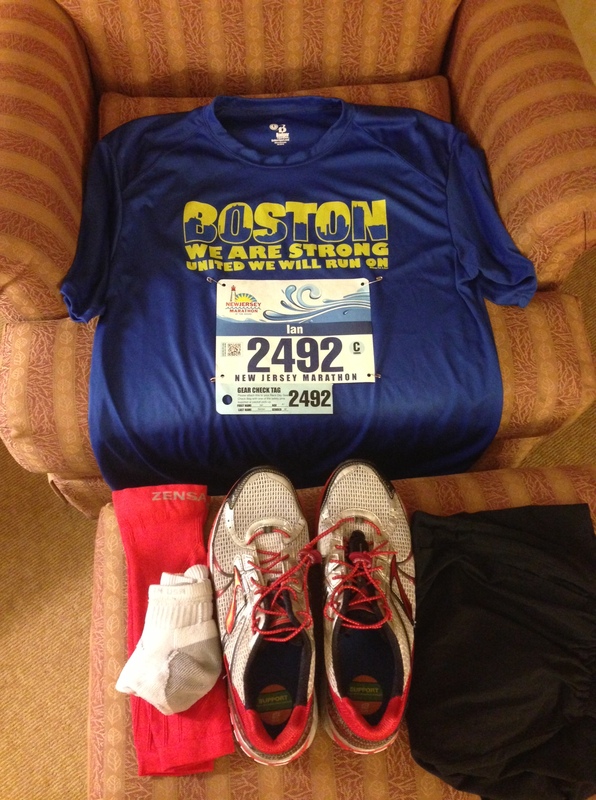 As with most races run after Boston the race directors and runners have encouraged each other to wear blue and yellow in support of Boston. 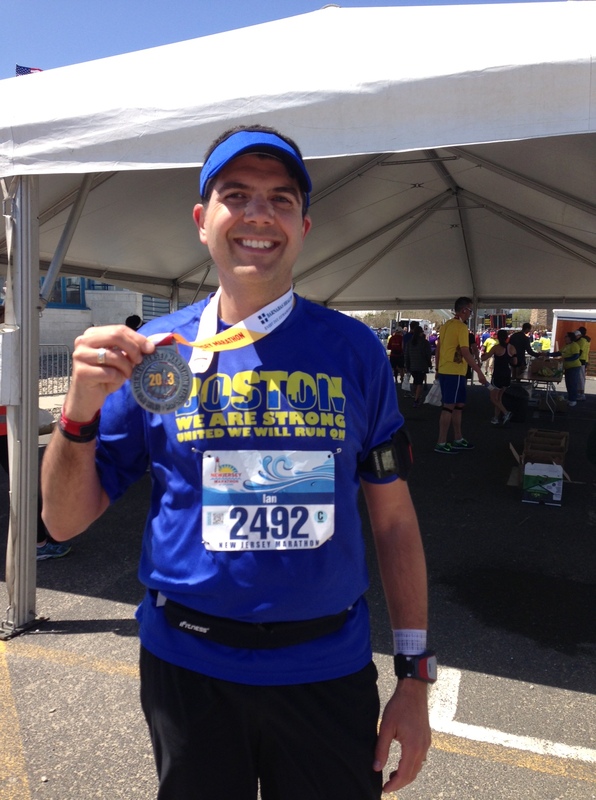 As I checked in on Facebook after arriving at the start area I checked in to ‘A Sea of Blue and Yellow on the Jersey Shore – NJM honors Boston’. The race itself was different from my last marathons. First of all there were around 2,300 entrants in the marathon. Philadelphia had around 12,000 marathoners and Walt Disney World had around 20,000 runners so this was a much more scaled down event and that did make a big difference out on the course. There was more space to run and the weaving in and out of runners was pretty much limited if at all. The start was held at Monmouth Park racetrack. I got there early (around 6am for an 8am start) to avoid the traffic and road closures for the Long Branch Half Marathon which started at 6:45am and which followed the same route for the first 11 miles. As I was there early I went and sat in the pavilion which meant we could sit inside a heated area and use indoor bathrooms (nice). Just after 7am I headed out to the bag check. This was a point to point race so if we wanted a jacket or other personal item we had to get it on the trucks so they could leave for the finish line before the roads closed for the marathon. 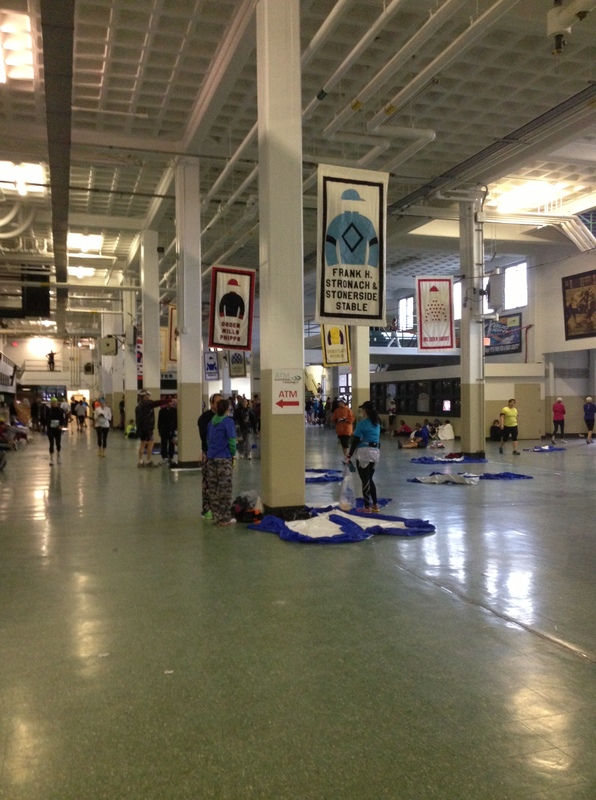 Staying warm inside the pavillion prior to the race. 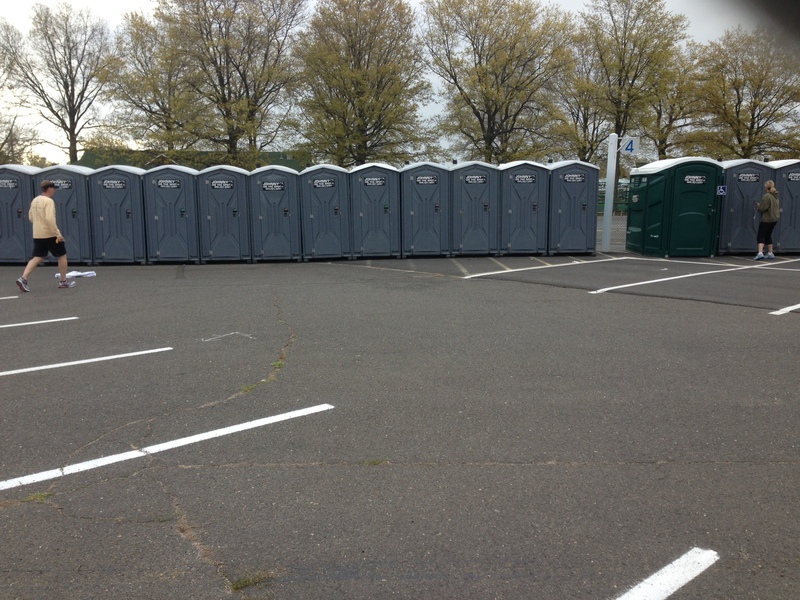 I guess due to all the Full Marathoners staying warm indoors the lines to the port-a-potties were non-existent. Awesome. They did get a little busy nearer the start of the race as people started to leave the pavilion but still no long lines. I had chosen this race over doing the Broad Street Run in Philadelphia together with 39,999 of my closest friends and thought about my experiences there waiting in line to go and hoping I didn’t miss the start of the race. Seriously, no lines? When was the last time you saw this at a race? It was getting near 8am so I sent my wife a good luck text message (she was running the Broad Street Run) and headed off to Corral ‘C’. I had packed my gear bag in the truck and was wearing a throwaway old sweater with a short sleeved T-shirt underneath. Shivering with my teeth chattering I wished I had decided to wear a long sleeved T-shirt as it was colder than I had expected based upon the forecast as there was more of a breeze than anticipated. As we were all assembling into our corrals, as if by magic, the sun came out. The National Anthem was sung by a marathoner who was celebrating his 100th marathon. This was followed by a short burst of Neil Diamond singing ‘Sweet Caroline’ as we celebrated running for Boston. I had planned to run 3:55 and had made myself a pace band and taped it around my left wrist beside my Garmin. I lined up in the corral between the 3:50 pacer (with a very well coifed moustache) and the 3:55 pacer and waited for the gun…or in this case the bugle horn (we were at the race track after all) and off we went. This is where I should have known something was a little off. I passed the 3:50 pacer within the first mile. My first ‘oops’ of the race. I tried to settle into a good rhythm using my Run/Walk interval of 4:00/0:40 and for the most part I was running very even splits (see the chart below). One thing that I did notice was that my heart rate was elevated around 170bpm (I wear the Garmin heart rate monitor). I put this down to adrenaline at the start of the race and looked for my pace to settle. Usually it is a little high within the first mile or so until I get into my rhythym and then it rises and falls between walk breaks (usually ranging between 135bpm-165bpm). For some reason no matter what I did my heart rate stayed between 165bpm and 170bpm. Strange. The course took us through many neighborhoods along the shore and there were still reminders of Hurricane Sandy. Some empty houses jacked up on stilts, houses with construction equipment out front, some stores still boarded up and burnt out. It puts lots into persepctive. The course itself had to be significantly altered this year as there was no Boardwalk. That was sad. To see broken wooden studs all along the shoreline where it is usually a great place to walk/bike/run. It is close to Memorial Day and the traditional start of the summer season and where there should be lots of foot traffic here. There will be none for while. But as they say, Jersey Strong. The tag line for the race is New Jersey – Up and Running and there we signs of revitalization and renewal showing hope amongst all the destruction. Getting back to the race itself, I seemed to be running steady if a little ahead of schedule for about the first 8 miles with no problem. Yes, my heart rate was elevated but I wasn’t suffering in any way. Around mile 8.5 I got passed by the 3:50 pacer. Oh well, that was not to be achieved today. I just had to get my head down and keep going. As I was running around mile 12 I was at the water station when I heard a volunteer say some ‘choice words’…in other words a pace group was heading in their direction and it was a big one! I looked over my shoulder and sure enough there was the 3:55 pace group. I didn’t think I had slowed too much so I thought as long as I could stick with this group I would be good for my goal. For the most part it was looking good until I reached mile 15. There were lots of turns on the course as we stretched out the route to make the distance and everytime I thought we were near a turn around there was another turn and a sea of runners off in the distance. Whoa. It took me back to the never ending twists and turns through the ESPN Zone during the Disney Marathon. It was a nice course to look at but the turns seemed to knock the wind out of me. Here are my splits. You can see that I was pretty consistent miles 1 to 14. In fact I ran the first half of the marathon in 1:55:31 at an average pace of 8:49. I seemed to slow a little through miles 15 through 19 reaching the 30K mark in 2:47:55 which still had me on pace to finish sub 4:00. But then I slowed considerably from miles 20 through 22. 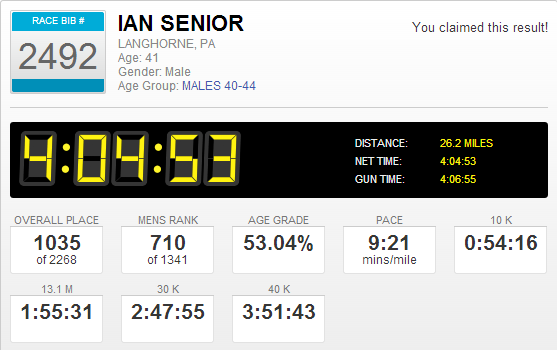 Around mile 22.5 I got passed by the 4:00 pace group and my times dropped to my worst pace for the last 3 miles. My new goal was then to finish before the 4:05 pace group! So my PR was not to be but still my final time was quicker than my first two marathons. I know I can and will do better in future and that I have to work on my first half pacing so that I achieve the elusive negative split. I ran the second half in 2:09:22. About 15 minutes slower. A friend of mine suggested I may have overdone it on my energy gels. I usually alternate between the full shot of caffiene and half shot of caffiene gels but for this race I took the full caffiene gels all the way. Maybe that was a reason for the elevated heart rate, maybe not. I will have to work on that for the next race. I still had a fun time. If I can finish knowing I gave what I could and still feel like I want to do it again then that’s a win. 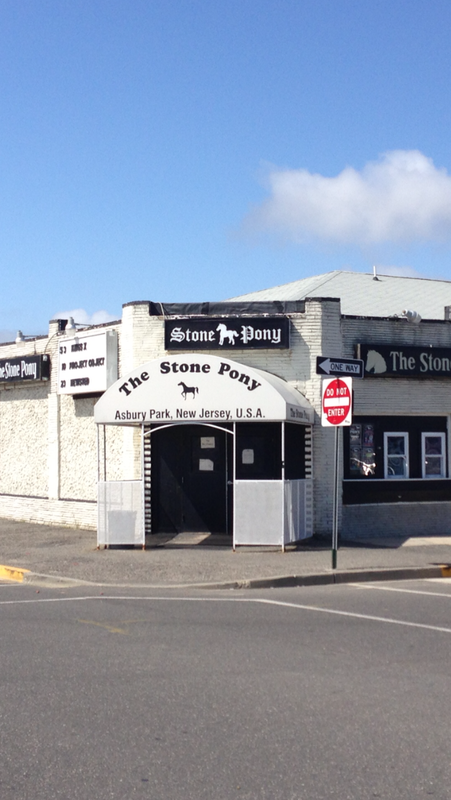 Plus I got a great shot of the famous ‘Stone Pony’ in Asbury Park. I may not have been ‘Born in the USA’ but I was ‘Born to run’ (sorry bad Bruce reference). 26.2 miles is still an achievement and completing the distance is a proud moment for someone who still considers themselves a new runner. I never tasted such a nice salty pretzel as I did at the end of this race, although at that point I will admit it hurt to even chew. I grabbed my bag from the gear truck and took the long walk to the shuttle back to the start line. The long walk kept me moving and really helped. I drove home, hopped in the shower, uploaded my run and headed out to meet the family. I felt good. It was a great day. This is a race I would recommend. It was great weather, great size and great organization. I would love to run this again on the original route along the Boardwalk when the Shore is fully restored. And I’m sure that will be sooner than later. I’m posting this a day late but there is quite a lot to look back on this month. 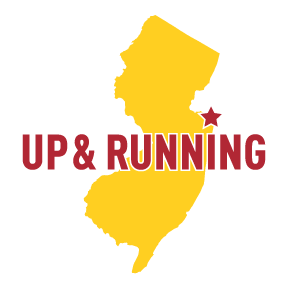 This month I logged 145 miles, logged a new Half Marathon PR, signed up for a new Disney race and began tapering for the New Jersey Marathon on May 5th. 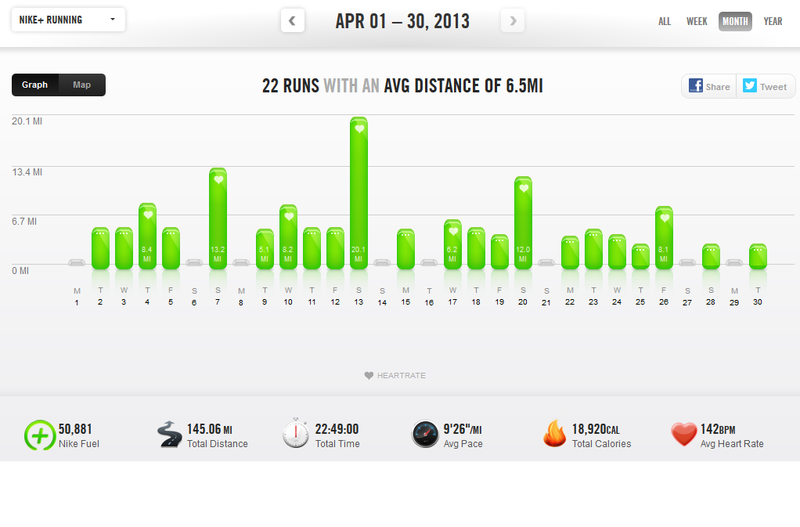 Spring is definitely here and I clocked more miles outside than inside than I have since the beginning of the year. I’m glad to be outside again although my podcast listening is falling behind (a decent trade off). runDisney also announced this month an addition for the 2014 Walt Disney World Marathon weekend. The new Minnie themed 10K race and the new ‘Dopey Challenge’. Needless to say I am in. I signed up to run again with Team Up/Autism Speaks and hope to beat my fundraising of just over $3,400 that I raised for the 2013 ‘Goofy’s Race and a Half Challenge’. Wish me luck. The taper itself has not left me frustrated like people often say but the strange thing about running significantly less mileage and catching up on sleep (days without an alarm wake up call!!!) have left me achy and feeling exhausted. Running is definitely a daily energy boost and all the aches and tiredness is hopefully just a sign of my body recharging before the big day. I actually feel refreshed and good about this weekend and hope to meet my goals. 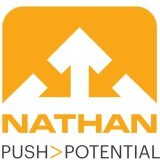 If it works out it works out, if not I remember I am not an elite runner and there will be other races. It’s about overall long term health and enjoyment. PR or no PR I will still have run my race, met the distance and earned my medal (and dessert)…although I will be trying as hard as I can for that PR. Hopefully I will be feeling fit and healthy and have a nice race recap or two at the end of May.